Welcome to our website. We hope this site will enable Nestaniotes from around the world to connect with one another and to celebrate our common heritage. The officers and Board members of the Central Society Tsipianiton of Chicago have all provided enthusiastic and financial support for this project; their names and titles are listed at left. Others have made invaluable contributions as well. In particular, I would like to thank Mr. Angelo Katris for allowing us to use Nestani.com for this website. Thanks also to George Papagiannis and Dr. Constantine Verros for providing some of the photos used. First, an explanation as to why we use “Tsipianiton” instead of “Nestanioton.” The Central Society Tsipianiton of Chicago was established in 1925, when the village was called Tsipiana. In 1927, the village name was changed back to its original name of Nestani, a name that dates to before 465 BC. This change was part of the Greek government’s broader effort to restore historic names to villages from the names given to them during the Byzantine and Ottoman Empires. To honor our founders, we have kept the club’s name as it has existed for more than 80 years. In the Gallery, we have included pictures of historical Nestani, Nestani, as it exists now, historical Chicago and Chicago today. And this is only the beginning! We strongly encourage all Tsipianites from all over the world to contribute their own photos in order to allow us to expand and improve this site and to document further the long history of our village and its people, both in the village and in the diaspora. Photos may be submitted by e-mail to this website. We have included a partial list of Nestani Professional Society, our “Epistimones.” This list was compiled for our 2006 Dinner Dance, when we honored the educational achievements of the sons and daughters of Nestani. Please help us to make this list as complete as possible. To be included, the person must (1) be of Nestani ancestry; and (2) have earned a four-year degree. We hope you enjoy this website and the opportunities it presents to bring us all together, and we look forward to your suggestions on how to build and expand this site in the future. Our village existed prior to: Circa 465 B. C.
Nestani is a mountainous, picturesque village built at the foot of Mount Artemision, about 15 kilometers from Tripolis. It is the first village of Arkadia on the new National Highway (E 65) coming from Athens, and it is about five kilometers from the Artemision Tunnel. The name Nestani is derived from the Ancient Greek word meaning " a return home" or "nostos". For centuries, Nestani was known as Tsipiana. "Tsipiana" derives either from the Byzantine word " Kepiana," which referred to gardens from the word "kepos," or from the Albanian word "Tsipouro," which has to do with grape vines and wine-making. The area was well-known for centuries for its wine. The name was changed back to Nestani in 1927, when the government decided to eliminate foreign connotations to all Greek place names. The village has a pleasant central square with interesting cafes, kiosks and stone-built houses. The square is also shaded by big plane trees. The settlement has an amphitheatrical shape at the foot of Mount Artemision and is distinguished by the traditional architecture of its houses. At the upper end of the village stands the imposing and beautifully painted Metropolitan Church of the Annunciation of the Virgin Mary. Towering above the village is the hill of Goula, with its strange and most recognizable shape. 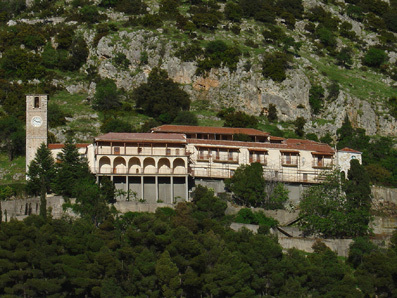 Goula offers a magnificent view of the countryside, and on this hill sits the Ancient Monastery of Gorgoepikoos. This Monastery holds a very special place in the hearts of all Nestaniotes. In the Middle Ages, a town or village with the name of Tsipiana or Kipiana was located on Goula. Traces of the original fort can still be seen there. At that time, the villagers moved from Goula to the upper part of the modern-day village, after which the Franks fortified the previous site of Tsipiana on Goula and established their headquarters there for a short time. During the Venetian and Turkish times, there was also a settlement of Tsipianites on Artemision at Malevo. Some of them lived there permanently until the Ottomans left, and others lived there in the summer months and had homes in the village of Nestani. Living in the mountains afforded people more safety from the invaders. Eventually, the people from Malevo moved permanently back to Nestani, and the Malevo settlement died out completely. Gortsouli. Manteinia is situated in the Northeast part of Arkadia. It has an area of about 205.393 stremmata (a stremma is one quarter of an acre). 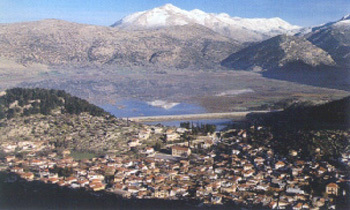 The majority of the settlements of the Municipality of Manteinia are built at the foot of the Mountain Artemision except for Kapsia and Simiades, which are built at the foot of Mount Mainalo. The settlements are semi-mountainous except for Sagga, which is mountainous. Manteinia's main industry is agriculture, based on cereals, vegetables, apples, honey, potatoes, pears, grapes for vinification and stock-raising products. Manteinia is famous for its wines, which have "Manteinia" as their name of origin. Its wine is so well regarded that it is listed on the European "Wine Tour". sometimes the valley floods to such an extent that Nestani seems to be situated next to a lake. This water empties through the Cave at "Katavothra" and winds its way to Argolida. 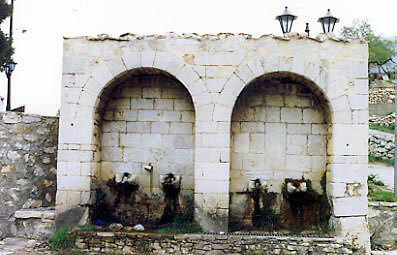 On the north side of Nestani, below the present day cemetery of St. Nicholas, there is a fountain that was built by Philip of Macedon (Alexander the Great's father) during a military expedition into the area. At the top of the hill known as "Stohos," there is a small church dedicated to St. John the Thermologou. The name of the Saint is derived from the time when people suffered from the fever caused by malaria and they would ask for the miraculous intervention of St John to cure them. At the foundation of this small church have been discovered remains of an ancient temple possibly dedicated to the goddess Demeter. Nestani is also famous for its festivals at different times of the year. One is the festival of St. George celebrated on April 23, a very old and beautiful tradition that has been preserved through the ages by the people of Nestani. All the participants are dressed in the traditional attire of the village and the men hold a shepherd's staff whose top is usually decorated with lilacs, wild celery, or other wild flowers. The colorfully dressed celebrants walk up to and down from the top of Goula singing the songs especially associated with the festival of St. George. They descend to the square that the villagers call "Tou Papagianni to Aloni" and there they form huge circles, dance the "sirto" and sing traditional songs of the experiences, hardships, and adventures of their ancestors from the time of the Ottoman occupation. 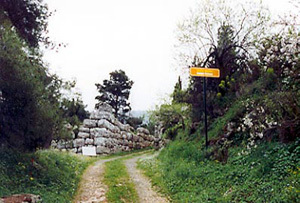 On a small hill next to present-day Nestani, there remain ruins of an Akropolis of Ancient Nestani (Nostia, or Nosteas). The town or village comprised one of the Demes (country districts) of Ancient Mantineia. The archaeological area includes traces of Pelasgian walls and parts of a tower. The surrounding wall had towers at set intervals and enclosed an area of about 6 stremmata. The gate or entrance to the akropolis is still discernible today. At the top of the hill, there are five blocks of stone, which seem to have been the foundations of a palace/temple. The village or town on this site flourished from the fifth century BC to the third century BC. 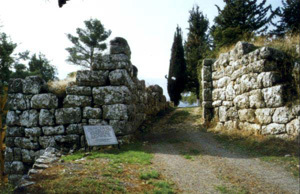 The remnants of the wall at the gate date from 465 BC. 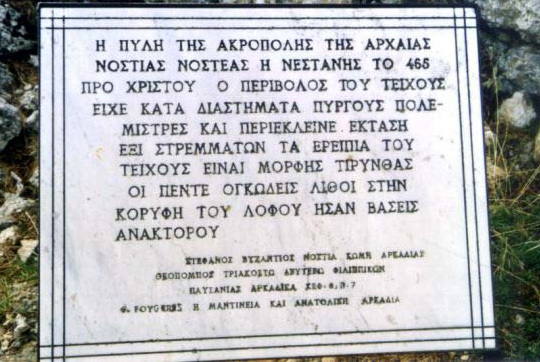 Translation of plaque in Greek below. The archaeological site can easily be seen today and is worthy of a visit. The Monastery of Gorgoepikoos is built on the western slopes of Goula—itself an extension of the mountain called Htenias—which towers 680 meters above Nestani. 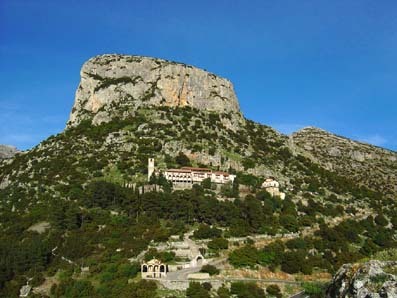 From its position on Goula, the Monastery offers breathtaking views of the surrounding valleys. It is believed that the Monastery was built circa 1030-1080 A.D. It is built on a pagan archaeological site as well as on remains of a very early Christian site. The ground on which the Monastery was erected has had continuing religious significance since ancient times. The stone stairs that lead to the buildings date to 1740. The church itself is tripartite, is domed, and regal. for the Monastery of Gorgoepikoos because they believe the Blessed Virgin prevented the village's destruction by placing her hand on and stopping a huge boulder that was coming down from Goula. The boulder stopped just below the Monastery and on it one can see the imprint of a hand. The Monastery also possesses a famous icon of the Blessed Virgin-Gorgoepikoos, which is reputed to have been painted by St Luke. In addition to its religious leadership through the centuries, the Monastery also provided leadership and help in the War of 1821 against the Ottoman Turks. At the top of the distinctively shaped peak of Goula or Koula ("Koula" means a stronghold and the term was used in the older documents to refer to Goula), which towers over the village of Nestani, there exist minimal remains of a fortress from the Byzantine settlement of Kepiana or Tsipiana. At the summit of the peak, there are ruins of a fortress and there is also a chapel dedicated to St. George as well as some ruins of the Church of the Ascension of Christ with Byzantine wall paintings. The Castle or fortress used the fortified site of the peak to keep on eye on the surrounding area. This site would have been contemporaneous with the site of Mouhli. nature and giving the mountain the look of a petrified giant. Below the monastery is the small church of St. Nectarios. "Panagias Gorgoepikoos or Kipianitisa." According to legend, the icon was created by St. Luke, author of the third Gospel. It is a very ancient icon with excellent iconographic technique. Silver and gold were added with donations to the Monastery during the service of "igoumenou" Gregory Papageorgiou. Gorgoepikoos means, "quickly responding" to prayers. This Fountain was built by King Philip, the father of Alexander the Great, circa 338 B.C. We want to thank the University of Patras for providing the history of Nestani. We took the liberty of adding some comments and pictures. Poseidon - "God of the sea and all water, springs and the protector of flora." near Mantineia (=Ptolis = Nestani? ), where she gave birth to God Poseidon..."